With the end of summer near, I can't help but start to think of putting my party hat on and get back to entertaining. So while I get my own plans in order, I thought I'd ask some of my favorite blogger hosts to share their favorite entertaining tips/projects with us. Kicking off the series is Toni of Design Dazzle. Her blog is stuffed to the brim with great parties so I knew she would have something clever to share. "I love to entertain. My real passion is styling and decorating for parties and events. One of my favorite go-to places for parties is the home improvement store. You can find many items there to make decor pieces. 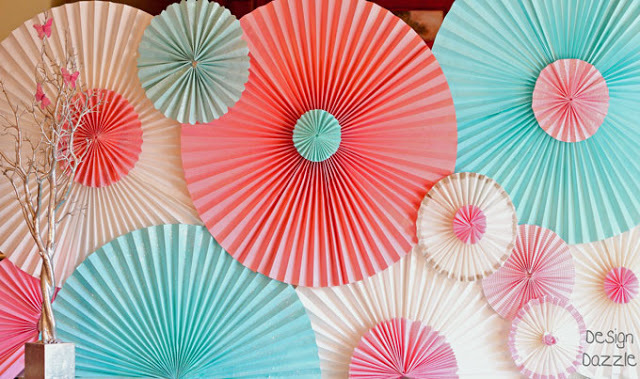 The large rosette backdrop tutorial I'm sharing is completely made from items found at the home improvement store - paper window shades, paint and polystyrene (for the support and backing). I also share how to make tissue flower poms. These party decorations can be showstoppers and are simple and very inexpensive to make!" Thanks to Toni for sharing a great tip (and a whole new way to look at the window treatment aisle!). As someone who spends far too much time in home improvement stores, this idea never even crossed my mind before but I will definitely be using it in the future! Do you have a great entertaining tip you want to share via a feature? Email me! What a great idea, I would never have thought of that! Very creative! Love the idea!